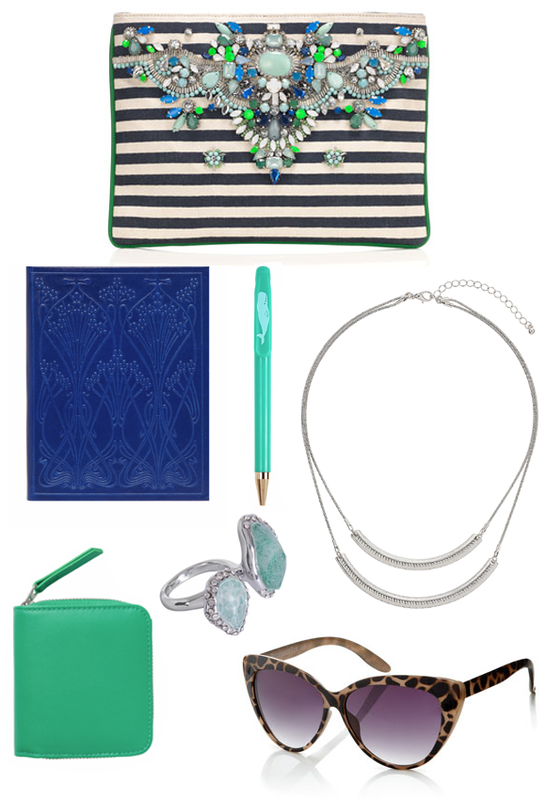 Lily Says: This collection of Accessories revolves around that amazing Gem Clutch Bag from highstreet favourite Accessorize. If I owned this bag I think I'd keep my jewellery rather simple so as not to look cluttered - with that in mind, this simple silver Double Bar Necklace from Topshop would be ideal! To continue the gem theme, you could throw some rocks on your fingers - I love this Amazonite ring from Alexis Bittar and would probably limit it to one stand out piece of jewellery so as not to detract from the bag. The simple green Molly Purse from Monki is a steal at £6 as are the gorgeous tortoise-shell effect Cat Eye Sunglasses from Accessorize at £14! Both could be easily popped into the clutch along with a handy Small Blue Notebook and slim-line Seven Year Pen and you're good to go!